Are your staff turnover rates higher than you would like, but you’re not able to make the investment required to change this? Or have you got great employees who you would like to have stick around in order to not lose your return on investment in them? Then this advice is crucial to you. You can’t afford to lose too many good people. It’s not cheap and that’s where a lot of your profit goes. It’s tough to hold on to good employees, but it shouldn’t be. Most of the mistakes that companies make are easily avoided. When you do make mistakes, your best employees are the first to go, because they have the most options. So if you want to avoid losing good employees and reduce staff turnover, you need to know the real reason people quit their job. And that is – because they feel under-valued or unappreciated. A simple answer with a simple solution, but an incredibly easy mistake many companies, employers and managers often make without even realising it. “My ideas weren’t listened to”. “I worked there for years and never got promoted”. “I was doing other people’s work and they were getting the credit”. “My boss never thanked me for my hard work, she just kept piling me up with more”. What do all of these reasons for leaving (and so many others) have in common? Underneath these statements, what people are really saying is – “I wasn’t valued” or “My contribution wasn’t appreciated”. Now whether or not that is the ‘truth’, it’s what was real for those people. Even if their manager said that they did appreciate that employee, that employee wasn’t feeling it. Somewhere along the line their actions weren’t aligning with their words and what was the result? Their employee left to seek that validation and appreciation elsewhere. There is a saying that People don’t quit their jobs, they quit their managers, and this is all too often the reality. At the end of the day, it doesn’t matter how good the salary is, how great the company is, or how good the opportunities are – if your employees don’t feel appreciated, they will eventually leave and they’ll take their skills, their knowledge and their experience with them. So how can you avoid this happening to you and your company? How can you reduce staff turnover and keep good employees on board with minimal effort? Learn simple techniques for showing appreciation (the right way) and you will not only continue to get the best out of your staff, they’ll also want to stick around and stay loyal to your company as a result. 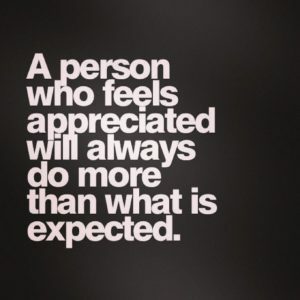 If you can master the art of showing appreciation and up-skill your team leaders and managers in this area, then you’re on the road to success. I call it an ‘art’ because that’s exactly what it is. There is an art to showing appreciation and it’s not as simple as giving your employees a high-five or a bonus. It’s about understanding the way THEY want to be appreciated, not the way in which YOU want to appreciate them. If one of your employees worked extra hard on something and did a fantastic job, wouldn’t you want to encourage them to continue doing so? Of course! If you’d like to build a high performing team – you need to learn how to determine the unique way in which your employees want to be appreciated (because they are likely to be different). You could call it ‘speaking their love language’, but basically it’s getting to know how that person wants to be thanked for doing a good job. Because everyone is a little different, right? Some people prefer gifts, others kind words. Some people like it when you do something nice for them (a service, or a surprise), others hate surprises. Some people like to be acknowledged publicly, others would find it their worst nightmare and it would probably do more harm than good! Either way you can see how important it is to get it to get it right when it comes to showing appreciation, or else there could be a lot of wasted money, time or effort spent on something that means little to someone else. There are some companies that continue to buy gift vouchers as a thank you for their staff when they’ve done something extraordinary, and some of the staff love it – others think it’s not personal enough to mean anything so it becomes wasted money. So you NEED to get this right to avoid spending too much time, effort and money in the wrong areas. I can help make this job a lot easier for you. Training individuals, leaders, teams and companies in effective appreciation techniques to keep staff engaged, productive and reduce staff turnover is one of the many skills my company’s training workshops specialise in. If you’d like to know more about this then let’s chat – get touch with us today to discuss your training needs. Want inspiration at your fingertips? Follow @InspireAffect on Facebook, Snapchat, Twitter, LinkedIn and Instagram.